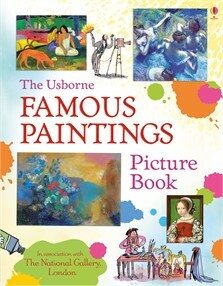 Choose a page number for links to the recommended websites for this book, or click on a link below to see lots more famous paintings. Click on a painting in the playlist. Drag the image and click on arrows to explore, or click on the small paintings. Click on a room to begin. This website uses Flash which may not work on all browsers. Scroll down and click on "Mini Gallery Activity (pdf, 3.6 MB)". Try an art gallery challenge! Discover some of the most famous paintings in the world, from da Vinci’s Mona Lisa to Degas’s Blue Dancers, in this beautifully illustrated information book published in association with the National Gallery, London. With contents and index pages for easy reference, and links to specially selected websites to take virtual tours of art galleries.